The Phoenix Suns kick off the 2014-15 NBA regular season on October 29th, 2014 at home against the Los Angeles Lakers. Phoenix takes on the defending champion, San Antonio Spurs on October 31st before hitting the road for the team’s first road game against the Utah Jazz. Although the Suns get Christmas Day off this year, they do take on the Sacramento Kings on Boxing Day (December 26th, 2014). Phoenix wraps up the regular season schedule on April 14th, 2015 at home against the Los Angeles Clippers. 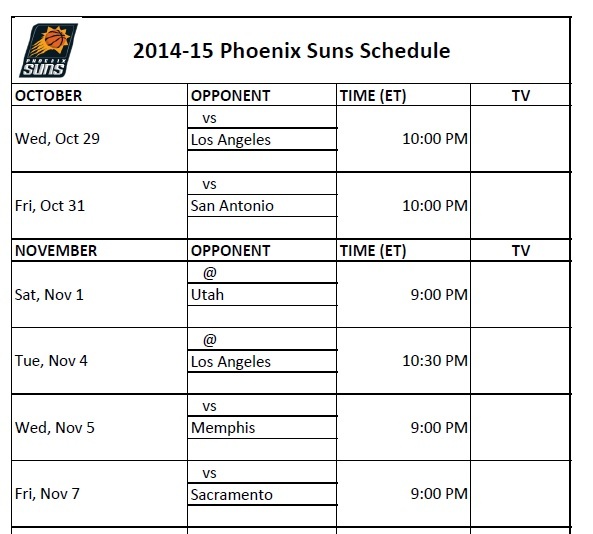 The following printable 2014-15 Phoenix Suns schedule is provided for those who would like to print out the team’s schedule for the 2014-15 NBA regular season.